SAN RAFAEL, Calif., Oct. 22 /CSRwire/ - With deforestation contributing an estimated 15% of greenhouse gas emissions, countries, NGO’s, and innovators are mobilizing to restore our planet's forests as quickly as possible to avoid catastrophic global warming. A Brazilian team of entrepreneurs has won the 2018 $100,000 Ray C. Anderson Foundation Ray of Hope Prize for the Nucleário, an all-in-one reforestation solution that mimics elements of natural forest progression to reduce maintenance costs and improve seedling survival rates. 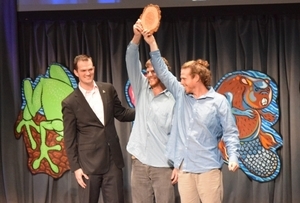 The team was awarded the prize at the National Bioneers Conference on Saturday, October 20, 2018.